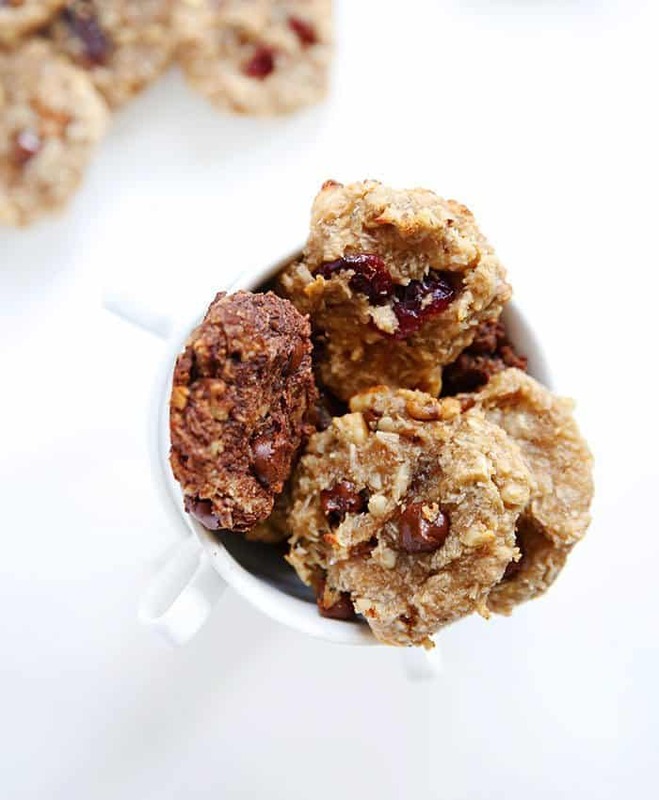 Aside from these breakfast cookies being packed with awesome nutrients, they are also easy to make and taste like banana bread. Yes, banana bread. Before we get into the cookies, I have to tell you how excited I am about today’s post. 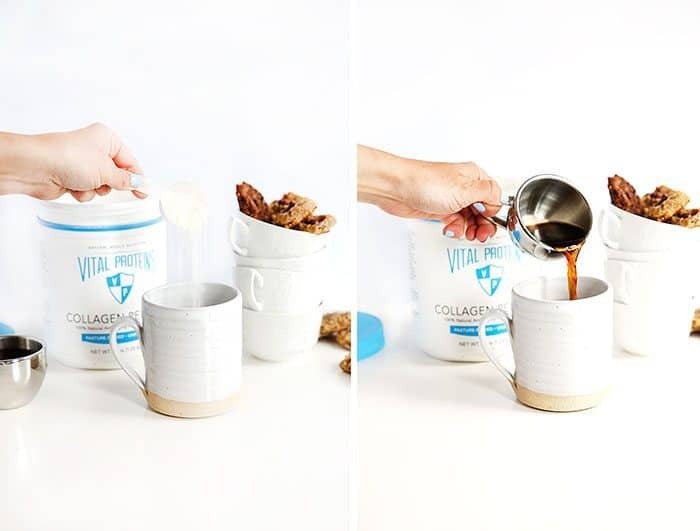 I am teaming up with Vital Proteins to share with you this protein-packed, delicious recipe, but I want to tell you why I love Vital Proteins Collagen Peptides so much, and how I sneak it into my diet daily. My mom and I have been adding collagen into our diets for over a year and a half now and have been truly amazed at what we’ve seen. Let me tell you about her, first. My mom’s hair hasn’t stopped growing and is thicker than ever. Before she started using collagen protein daily, her doctor told her she might have to start taking medicine for Osteoporosis. At her next visit her doctor was stunned that she no longer had it! Now, I’m not saying collagen is the cure, but it was one of the only changes she made so she absolutely attributes it. I love it as it’s wonderful for your skin, nails, and hair, and also for joint and gut health. Now, how do we sneak it into our daily routine (aside from breakfast cookies)? Through my coffee (yes it’s tasteless)! Easy breezy. I just add a scoop into the mug, pour in the coffee, and it dissolves instantly with no taste. But, these cookies… what a treat! Loaded with protein, healthy fats, and some good carbs to make up the perfect fueling snack anytime of day. Optional: Add 2 tablespoons of cocoa powder for chocolate cookies. Preheat oven to 350°F and line a baking sheet or a plate with parchment paper. In a bowl smash bananas until soft and mushy. Add in almond flour, crushed nuts, shredded coconut, and collagen peptides and mix to combine. Add in maple syrup, vanilla, and sea salt and mix to incorporate. Add in any add-ins as desired. Scoop 12 cookies onto the baking sheet and bake for 15 to 17 minutes. Lasts for up to 1 week in the refrigerator or in an air-tight container on the counter, or in the freezer for up to 1 month. For these cookies I use the blue bottle of collagen peptides, not the green. The green is for gummies and other gelatin items. The recipe sounds delicious. If someone in your family has a nut allergy, what other flour is available to substitute? Can you use other flours? like, coconut flour, or oat flour? Coconut flour would not be a 1:1 sub. I can’t guarantee other flour subs since I haven’t personally tried them, but oat flour may work! Actually banana flour would be excellent since it is a prebiotic for gut health. 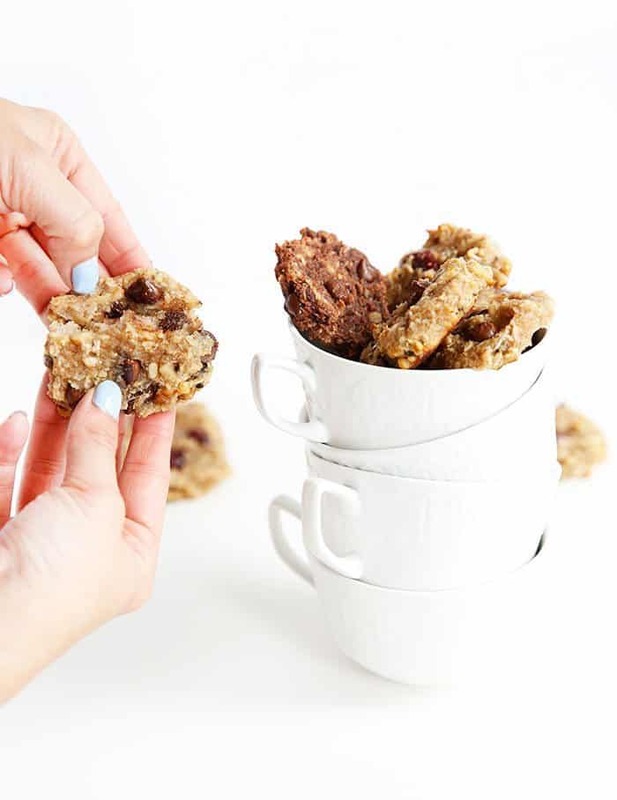 These cookies remind me of 3-ingredient oat cookies I make on the weekly for breakfast. Looking forward to trying these out for something different! Oh my gosh.. I just laughed so hard seeing “The Hoff” as your picture! Started my healthy journey On Monday and this would be great!! Totally making these tonight, I actually have all the ingredients on hand (for once!). I’m not a big sweet breakfast person but I think I’ll have to give these cookies a shot anyways 🙂 they look delicious! These are totally baller! I’ve been using it in everything too but never thought about coffee (which I’m drinking as I type this). Trying it out tomorrow! The cookies look delicious… And I think I will have to get some vital proteins for my mom and me, too! Thanks. oooh i would love to try collagen! I’ve been seeing Vital Proteins on IG and am really interested in trying them. I’ve been wanting to try this for a long time! I’d love to try it and see its benefits for my digestion and skin! I would love to try this product! My friend was telling me about the health benefits of collagen. I would love to experience these benefits for myself and my family. Such a fan of protein packed snacks! These are great for busy work days and pre/post workout. I’ve been eyeing Vital Proteins products for a while now, but since your comment on helping to heal osteoporosis (my mom has also been told to watch it/incorporate things to help prevent further damage), I will definitely be purchasing some for the two of us! This sounds like something I need to add to my diet ASAP! Cool completely??? Yeah right! Just took these out of the oven and they’re amazing. I used walnuts, dried cherries and cacao nibs. Added a pinch of cinnamon. My bananas were green so the maple syrup was perfect, but if they were ripe I would probably only add 1T. These are the perfect pregnancy snack and I can see them being awesome for breast feeding since they’re so simple to make. I love vital proteins, it’s helped with my joint issues immensely. Every morning I have a rooibos tea with butter, coconut oil and a scoop of collagen. P.S. Make sure you use the hashtag #lexiscleankitchen when you post on IG so I don’t miss it! These look amazing! Cant wait to make them! I love love love vital proteins!! TOTALLY MAKING THIS! Was craving for a cookie or cookies for breakfast! I’ve been reading a lot of people talking about collagen (especially Tina from Carrots n Cake). I’m really curious, but I haven’t brought myself to fork over for it yet! I can definitely see myself adding it to iced coffee, since I’m drinking so darn much of it anyway. These look delicious and easy! I would love to win.. thank you so much for the chance! Thank you for sharing your experience with this product and a recipe to try! I’ve seen a lot about it but hadn’t done the research. Thanks for this recipe, can’t wait to try! I’m always looking for easy make ahead breakfast recipes for traveling. Would love to try the peptides! These sound delicious and I love the idea of a chocolate version! These cookies look great! I keep hearing about collagen peptides and would love to give it a try. These cookies look awsome. I can’t wait to make them. I would love to try the collagen peptides. I’m wondering if we don’t have the vital proteins if is okay to not use in recipe? Or if the cookies won’t rise as much etc. But would like to win giveaway! Yes, can always use an additional tbsp of almond flour! I’m totally making these! My son will love them! 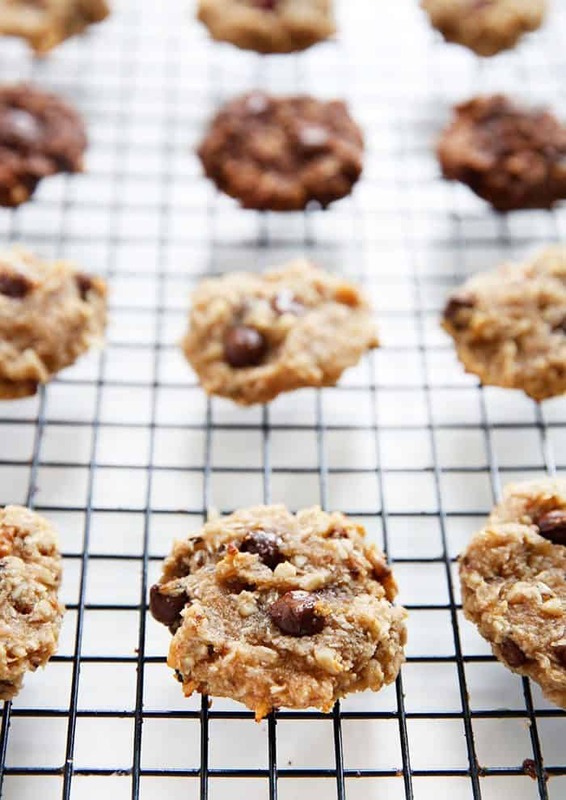 Happy to see a bfast cookie recipe that doesn’t include oats. I have been having trouble finding one. And excited about the giveaway 🙂 I have been hearing more and more about these collagen peptides and am growing curious!! Just learning more about the benefits of collagen. Can’t wait to try these — adding the cocoa! I just recommended that my mom try collagen for sore joints – funny that you and your mom have been using it too. I’d love to try it out! I highly recommend it. She has to stick with it for a number of months though, for sure. Major benefits! These turned out soooo good! In fact, I’m eating one warm from the oven right now and tastes like banana bread. Love all the clean ingredients and the Vital Proteins that are so good for you. We go through close to a tub a week of VP so would love to win one. I will definitely be making these again. Thanks so much for the recipe!! So glad they were a hit!! Yum! I so want to try this collagen!! Collagen is literally on my list of “to buy” this weekend! I am so hopeful I see great improvements in my hair and gut! I’ve been reading about this brand from Tina (Carrots-N-Cake) and thank you for the great write-up! These Breakfast Cookies look delicious!! And I would love to win some of Vital Protein’s awesome gelatin! Yum, can’t wait to try these! I’ve been wanting to try Vital Proteins! Thanks for doing a giveaway! I’ve been dying to try Vital Proteins products and this would be perfect! in fact if I don’t win I’m going to have to bite the bullet and buy some just so I can make this recipe, it looks delish! This recipe looks delicious, thank you! I was diagnosed with osteoporosis one year ago and have been trying to address this through improved nutrition and supplements. I just purchased a different brand of collagen peptides earlier this week. Would love to try the Vital Proteins brand. I use collagen peptides in my smoothies every morning and LOVE them! Thanks for sharing a new recipe to try. I would love to try these. I might actually leave the collagen out though (any other ideas?). Last time I used collagen peptides for a week I had a big outbreak of cold sores. Later learned that collagen is a trigger. So cold sore sufferers beware! Excited to try adding this to cookies. I just started using collagen and hoping I feel a difference. Thank you Lexi for making me feel like I can make this very important diet change!!! What could be better than cookies for breakfast?!? Yum! Can’t wait to try the cookies AND the collagen! What a delicious recipe! My kids aren’t great breakfast eaters and I keep looking for easy and delicious ways to send them off to school ready to learn and play. I will definitely try your recipe. These look delicious, and I’d love to try the collagen. Do you have the nutrition info for the cookies? I just found out I have low bone density. Would love to try the collagen to see if it helps! Hi Jenny! You won!! Please send me your address to Lexi@lexiscleankitchen.com! yuumm! I’m making these this weekend! After my daughter woke up before 6am this morning, I needed something yummy and quick for breakfast that would go well with the loads of coffee I was about to consume! 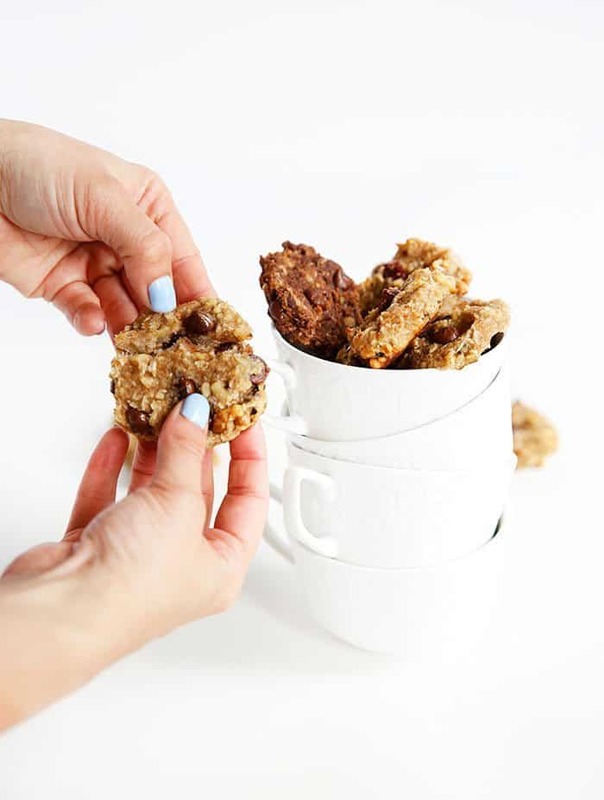 So we made your breakfast cookies and they were a hit with me and my early riser! I did not have the collagen powder (though I’m researching it’s benefits right now! ), but added PB2 and flax seeds. Yummy! Thank you! So glad they were delicious! These cookies look like a great way to change up the breakfast menu. Collagen in coffee? Win-win! I take collagen to heal my gut from inflammation & leaky gut, along with my Hashimotos. I am thrilled to find this recipe! Always looking for new ones to try! I am trying to heal my leaky gut and a bunch of other health issues. Love this idea for sneaking in collagen peptides! Thanks for the great recipe! Can’t wait to make them! These look amazing, Lexi – and you totally have me intrigued to try Vital Proteins. Just as soon as it cools down enough to crank up my oven, I’ma make these for my babes as an afternoon snack. She’ll dig ’em! I hope you love them girlfriend! These cookies look so yummy :)! These look great! I can’t wait to try them. I am also really interested in the colleges peptides too. Love your web site! 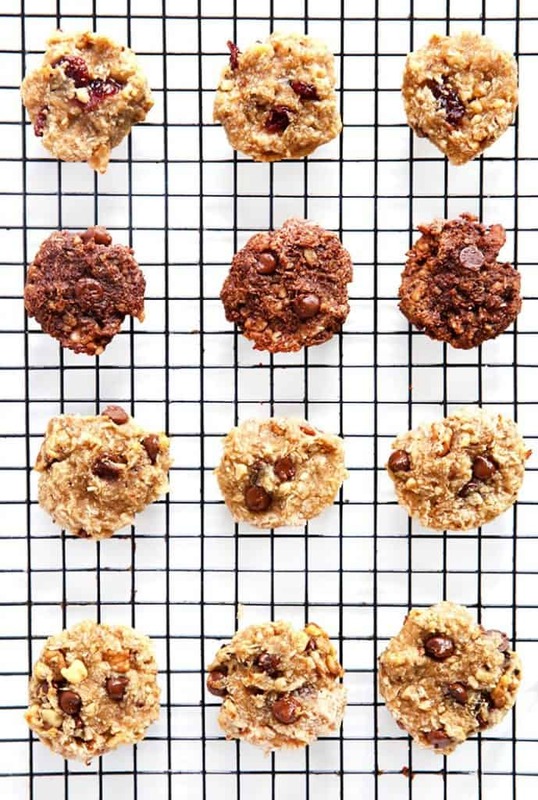 These look delicious…great healthier alternative to the sugar-laden cookies i usually end up snacking on. Can’t wait to try them! I am curious about the collagen peptides. Any suggestions on where to get “good” information about the health benefits and downsides(if there are any)? I have been seeing a lot recently about these Vital Proteins. I would love to try them!! Look forward to making these tomorrow. Great for on the run mornings. when I make this recipe I am for sure gonna triple the ingredients! I have been wanting to try collagen and I started following this company on Facebook because it is the brand Jennifer Anniston uses! They look fantastic! I can’t wait to make them! Wow! I’m really excited about this recipe and about the Vital Proteins! First, in the picture of the recipe, my eyes deceived me at first glance, and they looked like thumbprint cookies. Do you think these cookies would stand up to filling with a bit of preserves? I think that would be amazing combination with the nuts, especially as a breakfast cookie! Second, I had never heard of Vital Proteins. I currently use Jarrow Formulas unflavored whey protein. I definitely want something pure, without any flavorings, colors, or sweeteners. The Vital Proteins looks like something I would regularly use, and I will definitely try it! I’m in Aus, so I will use a different gelatine when I try this recipe. It’s not meant to thicken is it, just to easily blend in? Never tried VP, but sounds wonderful, as do the cookies!! Looks delicious! Can’t wait to try this recipe. thank you for the simple healthy cookie option. I am always looking for ways to incorporate a healthy “snack” idea into my diet that wont totally derail my healthy meal selections during the day. Those cookies look amazing! And the health benefits sound great too! Super interesting! Thanks for sharing! I usually put collagen in my tea, but don’t have it every day. this sounds like a fantastic idea to get it in this way through out the week. Cookies look great! Think I’ll try vital proteins even if I don’t win! Cookies look yummy! Would love to try the collogan out! These look delish-us! A definite must try! I’m also glad to see you have a cookbook, I like something organic to hold in my hands and look at! Thank you, Lexi! These cookies look incredible. When you said your Mom’s hair has never been thicker I was immediately intrigued! I’ve got to try this! Based off your review, just started sending my mom this stuff to try and help her joint pain! I don’t use collagen regularly, but may have to now. I love the use of them in breakfast cookies for extra protein. Never thought of putting it in coffee either. Thanks for your ideas! Will make your cookies this week. Would love to win the collagen! Hi Sue! You won!! Please send me your address to Lexi@lexiscleankitchen.com! These look delicious! I love incorporating collagen peptides into my recipes too. I am wondering if one could make something similar with apples. We do get a lot of bananas in our diets around here! These look amazing…. love to see a breakfast cookie without oats. Ordering the collagen today. Do you know if these cookies would freeze well? Sounds like they’ll go fast, but I’d love to make a BIG batch and be able to free some for those weeks I’m too busy to bake. Can’t wait to try these out tonight! These look great, can’t wait to try! These look so good, and what a delicious way to sneak in some healing collagen! Woo hoo! Will try the cookies today! I think I have everything but the collagen peptides and will make this recipe this weekend, it looks so good! I tried a collagen protein a few years ago, but it was so gross and I had trouble finishing the container. It sounds like this would be more palatable than the one I had and I sure know I could use the collagen boost! I’m so glad I found your blog! Your blog will help me be successful on my quest to clean eating. Thanks for sharing your wonderful recipes! I have been wanting to try the collagen peptides for awhile now, but I have only seen recipes using them in smoothies. Love the idea of using them for baking too! I heard about you from the Fed & Fit podcast. Looking forward to using your site as another source of great recipes! So happy you found me!! I am a mom of six and grandmother of six and have the same things as your mom. I have tried Great Lakes gelatin in my coffee and I like it but if you do not finish coffee it turns to gelatin. Does this type work the same? 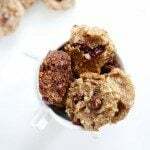 Trying to have Bullet Proof or Rocket Coffee every morning and going to make these cookies to get in more collagen. Too many fun things in life to do to stay in bed with hurting joints! You need to buy the green Great Lakes, not the red!! I am very intrigued by this product….can’t wait to try them (whether I win them or not). I had an old breakfast cookie recipe that I loved, but it definitely wasn’t clean. So glad I found this recipe! I miss being able to just grab a few cookies and go. i’ve used collagen before but i’ve been wanting to try vital proteins’! thank you for the chance! These look yummy! Thanks for the recipe and giveaway! I love adding some protein and nutrients to my baked goods! Your recipes have really encouraged me to eat clean! Love them all and can’t wait to try the breakfast cookies!! Very excited to try these breakfast cookies. My kids are extremely picky eaters so I’m looking forward to another option for them. Regarding the collagen, how much to you consume per day? It says the serving is 2 scoops. Considering all the other supplements I buy, it’s not extremely affordable to spend $40 a mth on another one but I definitely see the value in it. Just curious if the serving size is what you need in order to see the benefits. Cookies for breakfast sound amazing! Trying to find ways to mix it up a little. These look so good! I also have been hearing so much about Vital Proteins and really want to try out their products! These look delicious and I am always looking for healthy recipes to try!! Oh my word these were ridiculously good. I used EnjoyLife choc chips and added some raisins. Had to cook them a little longer but Wow! My new favorite bfast cookies. The kids liked them to which is always a big deal. Thx for the recipe Lexi! So so so glad they were a hit! Cookies sound great! The collagen sounds intriguing. Thank you for sharing. These look like perfect pregnancy snack. I will try them this weekend. I’m going to try these today!!! I would love to win so that I can try these cookies! They look great!! Is there a calorie/nutrition facts breakdown on these cookies? Sorry if I missed it, they look delicious! Proteins. Definitely going to make these cookies too! These look great for grab and go breakfasts, especially once school starts back. I’m usually so busy getting everyone set with breakfast, snacks and lunches that I un out of time for my food. These will be a game changer! These look really delicious and, most importantly, simple! Definitely going to have to give these a try. I love having grab-and-go snacks lying around. Hi! What would be the best way to freeze these? Make the batter and then freeze, thaw before baking OR bake and then freeze cookies individually? I wasnt sure how the collagen would react to freezing. Freeze after baking, and then let sit to room temperature! I am so excited to try these! We are trying to clean up our diet, and with four little kids things like this have been hard to find. I think they will love them! Is the crushed ground walnuts more like a flour rather than chopped walnuts? Hello – is it okay for kids to eat them with the cologne in it? Also are they designed to keep you full? Can you add oats to fill you up more or no? Yes it’s fine for them! Holy. Bananas. I just baked Lexi’s breakfast cookies. 😍😍😍. Phenomenal!!! I didn’t have enough walnuts so I added in some pecans too, along with a few dark chocolate chips & dried cranberries. I will have a REALLY hard time saving these for breakfast and not eating them for dessert everyday. We have a banana allergy in the family. Any suggestions on a substitute? I’d love to try this recipe!